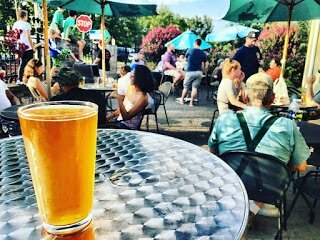 Fun local blog highlighting all the magic happening in Hyattsville, Mount Rainier, Riverdale Park, College Park, Greenbelt, the Route 1 Maryland suburbs of Washington, D.C. and beyond! This Thursday into weekend, servin’ you up a sprinklin’ of some of my solid, tried-&-true recs to explore along with new events to put on your calendar, like Jon Smith (think Freddie Mercury + David Bowie) at Robert Harper Books, Pyramid’s 10×10 Opening Reception, Yoga-Dance-Movin’-with-the-Mayor, College Park Blues Festival & more. Details below! One of my fave farmers markets! Get your fresh and local produce right here! Live music, too! We love strolling around the Riverdale Park Farmers Market, buying some fresh, local produce, grabbing a bite from one of the vendors, absorbing some tunes while the kids frolic around and then we all head to Town Center Market to enjoy a tasty beer or 5 outside. Our very own Open Mic at the barbershop. We provide a microphone or direct input for guitar, you bring the performance!! hosted by Jim Groves, for all types of music! This one’s definitely cool to check out! Jon Smith plays all of his instruments and sounds a cross between Freddie Mercury + David Bowie. For two hours, audiences can expect a diverse chorus of voices, and a vast array of professional spoken word performers, open mic rookies, musicians and a different host every week. Cost: $5 suggested donation. Must RSVP here. Give what you can, when you can by cash or card. Join us to support local non-profit CASA de Maryland this quarter (50% of proceeds to go chosen program, 50% to instructor for their offering). Cost: Donation amount up to you! Love art, especially art created by local artists? Well, here’s your chance to buy some at prices you can afford! Featuring artwork by over 85 regional and national artists, each artwork can be purchased for $50 and taken home day-of! Join the Mayor for this Chakra fusion of user-friendly movement inspired by the ancient wisdom of yoga. All ages. Featuring live bands, dancing, vendors, craft beers and more! Check out this national, intercollegiate, South-Asian fusion dance competition! Bhangra to hip-hop, contemporary and West-African! Numi Yoga Birthday Open House! Celebrating our first year with the community who has made it all possible! There’ll be food, music, drinks, games and prizes! Ukelele jam the first Sunday of every month, hosted by Phillip “Rainy Day” Daniels. ICYMI – Have you seen these posts? Check ’em out! Check Out the New Little Free Library! Event information is subject to change or weather cancellation. Copyright Route One Fun and Sarah Byrne, 2019. All Rights Reserved.